Britta Ambauen pairs sweet nicknames from around the world with charming drawings to create her pendants. We all know "honey" and "sweetheart," but some opt for more poetic nicknames. Inspired by terms of endearment used around the world, Britta Ambauen created a collection of necklaces engraved with sweet epithets. Some are cute, like mon petit chou (French for "my little cabbage"), and some are romantic, like mo chuisle ("my pulse" in Irish), but they're all sure to delight the one you hold dear. 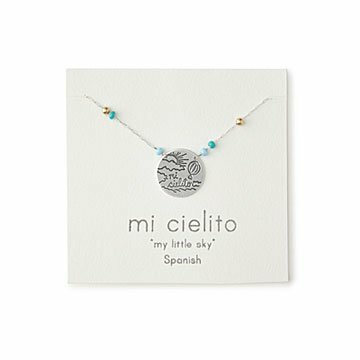 Each term, accompanied by one of Britta's delightful illustrations, is printed on a sterling silver pendant and paired with six colorful Czech glass beads. Give one to your bogarkam ("little bug" in Hungarian), whether that's your true love, child, or even an inside joke with a close friend. Handmade in Seattle, Washington. Pendant: .7" Dia Chain: 18"